When Alicia asked me to lunch, she said I should pick the place but it turns out that she chose Seven Oaks because she’s heard so much about it. I’ve not dined in this café before so I readily agreed to her suggestion. I’m familiar with the site where Seven Oaks Bakery Café is situated and I watched as the building took shape. When its doors were opened, there was a great deal of hype, particularly for their famous molten salted-egg croissants. While, I’m a great fan of salted-egg flavoured food, I did not join the mad queues for a taste of the much-touted croissants. One of the considerations about dining in Taman Pelangi is the challenge of finding a proper parking space so as we are driving there, we send up an arrow prayer for a parking spot within a reasonable distance from Seven Oaks. And lo and behold – when we turn into Jalan Serampang, an empty lot is waiting for us! A security guard, who also doubles up as the doorman, politely opens the door for us. The ground level is the retail section for bread and pastries while the café is on the upper floor. It’s just one flight of stairs up but there is also an elevator for guests to ride up and down more conveniently. Later I notice that there is yet another flight of stairs up to the next level of dining area, so it makes sense to have an elevator for guests with young families and senior citizens. Fsrom the façade’s ornate design, I expected the decor in the café to be equally opulent and I was not wrong. Salon brocade chairs, upholstered chairs, crystal chandeliers, heavy curtains, wallpaper with brocade designs, wrought iron balustrades and a vintage scallop-edged lampshade with tassels, simply reek of the Regency era. I thought I had walked into the pages of Pride and Prejudice and half-wished to meet with my Mr Darcy here! The tableware and cutlery are well laid but an electronic call button on the table seemed rather incongruous to the lavish setting. I guess this call button is necessary, especially for guests at tables that are situated behind the staircase and elevator shaft, who needed to call for service. So from time to time, I can hear that “ding-dong” chime over the piped-in music. The wait staff seem to be well-trained to a point. She leaves the menus with us with an assurance that she will be back to take our orders. I’m quite excited to see Lobster Bisque and Clam Chowder in the menu but before I place our soup orders, I ask the waitress if they are made from fresh ingredients or if it was from a can. She replies, without hesitation that it was all own-made. Alicia then picked the bisque while I chose the chowder. Besides the main menu, there is a separate page for lunch promotions. We take our time to look through the choices before making a decision on our main course items. When we are giving our orders to the waitress, only then are we told that the particular item picked from the lunch promo menu, is not available. I can’t help feeling rather miffed because the waitress should have mentioned ahead that all items in the promo menu are available except this or that item. Then we need not waste time considering those choices which are already no longer available! So a few more minutes are spent in making an alternative main course choice. After our meal order was taken by one waitress, another came to our table with the order print-out to request us to confirm if the order was accurate. Order-takers are wearing hands-free speakers and some sort of a radio transmitter in their pockets that emitted scratchy sounds – which I can hear when they are nearby. The waitress also gave each one of us, separate print-outs with our free WIFI user names and passwords that are valid for four hours’ use. This reminds me of my experience at a coffee place in New Zealand that offered limited usage of their free WIFI with the password printed on the bills. But here, each diner receives individual print-outs with passwords! I guess the culture of photo-taking and instant posting in social media, is much encouraged. Our soup is served in elegant bowls and even before we finished, our main course items arrive at the table. I tell the waitress to set it down while we finish our soups. I thought that with the number of wait staff equipped with radio transmitters, they could have been more attentive to keep an eye on guests who have finished their soups before sending the freshly prepared main courses to the table. They were, however, attentive to remove empty dishes from the table while we continue with our meal. Alicia said that she didn’t want any coffee after the meal because lately, she was not sleeping as soundly as she wished. This gives me an opportunity to use the call button to summon the waitress and she comes soon after the “ding-dong” chime sounded. “Do you serve decaf coffee?” I ask her, in the hope of getting a decaffeinated coffee for Alicia. But the waitress responds with a puzzled look and I safely conclude that they don’t have any because she didn’t even understand what I wanted. After a moment’s hesitation, she tells me that she will check. When she comes back with a negative reply, she repeated my coffee order – less one for Alicia. While the individual toilet cubicles are designed with modern fixtures and opaque glass doors, the centerpiece in the restroom must be the ornate framed mirror above the sink, complete with a brass decorative faucet, set on an equally ornate table! On my way back to our table, I pass a cake counter with rows of beautifully decorated pastries and pause for a closer look. Assistant Manager, Pancho Galvez, welcomes my interest in their cakes and pointed out that their best-seller is the D’or, a rich chocolate confection with a hint of cherries. I simply have no room left to savour their cakes so I agree with Alicia that we should probably keep the cakes for another visit to Seven Oaks for afternoon tea. When we paid the bill, the waitress gives us a feedback form to complete. I ask in jest if I may be brutally frank and she replies, "Yes!" with a smile. I ask Alicia for her comments as I complete the form and return it to the waitress. Its good to know that this cafe is serious about providing quality standards in food and service and I hope they will take the feedback constructively, to make all the necessary improvements. It is a little after 2.30pm when we come downstairs to the retail level to look at the bread and pastries. We are inevitably seeking out their popular molten salted-egg croissants but in vain. One of the helpful sales assistants must be listening in to our chat because she supplied us with the answer to our futile search. We are so naïve! Apparently, fans of the molten salted-egg croissants are aware that the daily batch should be ready for sale at 2pm and they will join the queue to buy, from about 1.45pm. When they start to sell the croissants at 2pm, she said they would be sold out in about 20 minutes! Ah! No wonder there is not a trace of the elusive molten salted-egg croissants then! So this is yet another reason to visit Seven Oaks again – timed to join the queue at 1.45pm – to ensure that we can buy a croissant or two when they go on sale at 2pm! Administrative Professionals Day this April will be celebrated by the Johor Association of Professional Secretaries and Administrators (JAPSA) with a workshop, “Unleashing the Power of You: Revive, Restore and Renew” and High Tea reception. 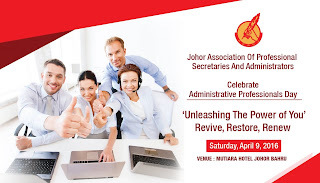 Founded in 1985 as the Secretaries Society of Johor by a group of secretaries who were then ordinary members of the Malaysian Association of Productivity Johor, this association of secretaries has since changed its name to JAPSA. 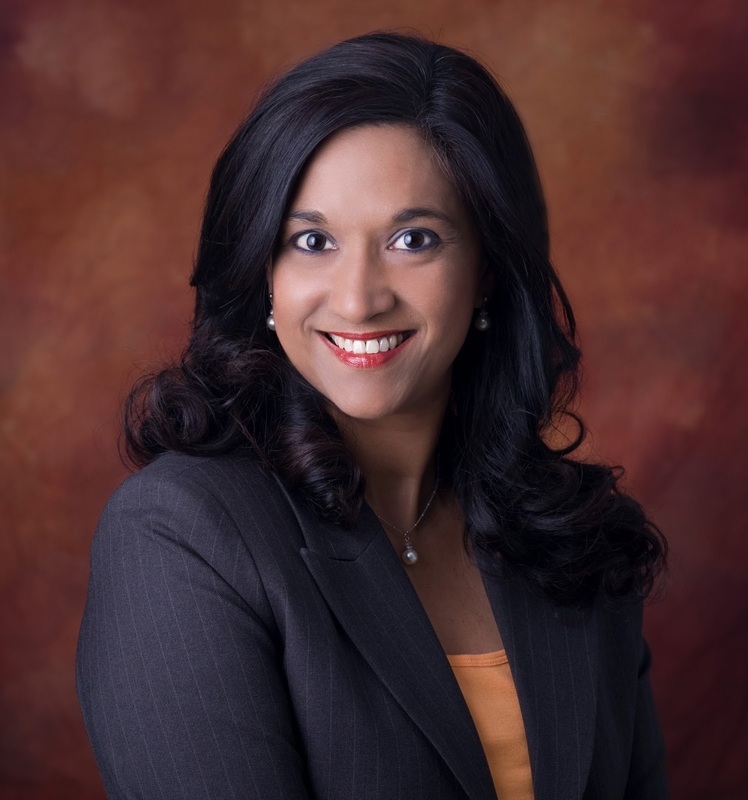 JAPSA has established a tradition of celebrating Administrative Professionals Week every two years with a training event to give participants the opportunity to refresh their skills and celebrate with fellow members in an organised gathering. This year, the celebration includes a half-day workshop training session with a High Tea reception at Hotel Mutiara Johor Baru on Saturday, April 9. The event programme will start with arrivals and registrations at 8.30am followed by the training session facilitated by Ruth Fernandez, a qualified group fitness instructor and health coach who has close to 20 years’ experience in education and training in South East Asia and the United States. This workshop will guide participants on how to unleash their external and internal power and use it to make better life choices, both in the workplace and in personal life. Among other interesting things, participants can look forward to acquiring the skills to create winning impressions using the ABC’s – Appearance, Behaviour and Communication. "I sincerely hope that every JAPSA-rian will support this event by registering yourselves and sharing the info about this event with your colleagues, business associates and friends so that they too may benefit from the training," said JAPSA president, Vijaya Subramaniam. Workshop fees are only RM168 for JAPSA members and RM178 for non-members payable in cash or by cheque made in favour of JAPSA. Participants have the option to join the High Tea held in the Mutiara Coffee House after the workshop, at an additional cost of RM58 nett per person. For more details and to sign-up, please telephone: 012 – 719 8885, 016 – 711 1813 or 0111 772 2986. Happy Administrative Professionals Day! The Johor Sultan, His Royal Highness Sultan Ibrahim Almarhum Sultan Iskandar, made history when he graced this year’s Johor Chingay parade with his presence. When Sultan Ibrahim announced that he would join the rakyat for the Chingay parade this year, the Johor Baru Tiong Hua Association was abuzz with excitement. Having kept this annual tradition for the Johor Old Temple or Gu Miao since the mid 19th century without interruption except once during the 1942 Japanese invasion, the Johor Sultan’s presence at the Chingay was of great significance to the Johor Chinese. 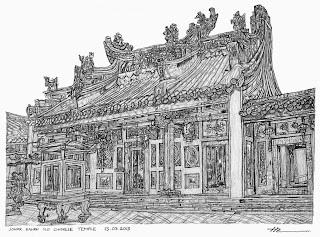 Unlike other Chinese temples that usually bear the deity’s name, the Johor Gu Miao is believed to be the first Chinese temple in Malaysia to be named after a State. 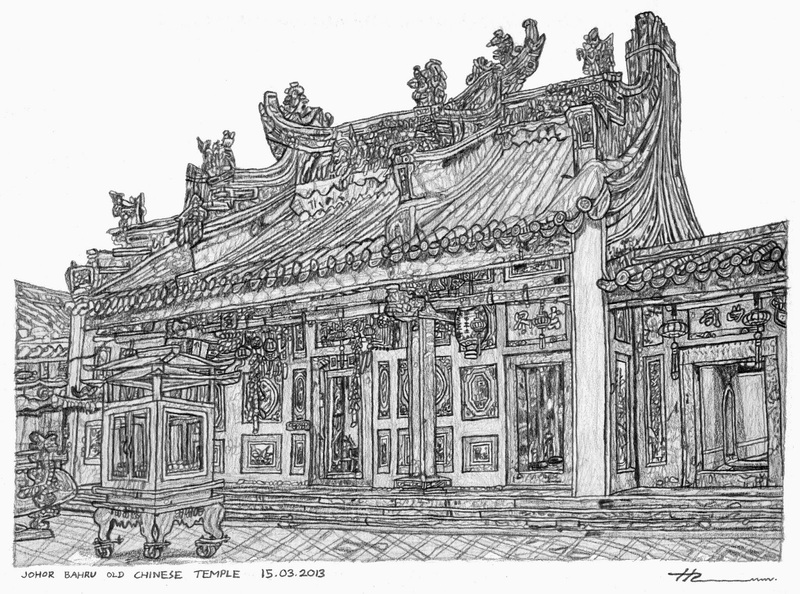 The strong relationship between the Johor ruler and the Chinese immigrant community was the underpinning reason for “Johor” to be part of the temple’s name. To understand this unique relationship, we should look back to 1844 when Temenggong Daeng Ibrahim invited Chinese planters in Singapore and the Riau Islands to open up land in Johor to cultivate pepper and gambier. At that time, gambier plantations were successfully run in Singapore and Riau but after being cultivated for 10 to 15 years, the land was exhausted and infertile. So when Temenggong Ibrahim invited them to move to Johor, the Chinese were ready to relocate. Immigrant Chinese with a strong pioneering spirit were attracted to the prospect of huge tracts of land, just waiting for them to clear for cultivation under the kangchu or River Lord system. Under this administration, planters who arrived in Johor, obtained a permit known as, surat sungai, from the ruler. In the kangchu system, the kangchu or River Master were permit holders who could collect taxes and govern Chinese communities on their land along the rivers. While kang means “river” in Teochew dialect, a kangkar was the disembarking point, usually its middle or upper reaches along the river. Not long after Iskandar Puteri was established in 1855, the Chinese accepted Temenggong Ibrahim’s permits to start plantations here and they arrived by cargo-carrying barges or tongkang through the Segget River. The Teochew Ngee Heng kongxi or society, led by Tan Kee Soon was the dominant Chinese clan who made Johor their new home and settled mainly in Kangkar Tebrau. Iskandar Puteri with its capital, Tanjung Puteri, was then a frontier outpost with a few huts near the river, occupied by fishermen and charcoal-makers. Surrounded by jungle and mangrove forests, a flagpole flying the Johor flag near a police post on a hill represented the presence of a government. If you have seen the Sultan’s hunting trophies preserved in the Sultan Abu Bakar Royal Palace Museum, then you have an idea of the types of wild animals the once roamed the dense Johor jungles. Besides being confronted by elephants and tigers, immigrants lost their lives to strange diseases and the harsh environment as they braved physical challenges to clear the jungles through the rivers into the interior to open up land for cultivation. Before the invention of chemical dyes, the juice from gambier leaves was widely used for leather tanning and cloth dyeing. The widespread cultivation of pepper and gambier played a vital role to boost the state’s economy, put Johor on the world map and brought wealth to the local community. With Europe as a major market, Johor became the world’s largest producer of gambier between 1830 and 1850. His son, Temenggong Abu Bakar succeeded Temenggong Ibrahim in 1862 and appointed Tan Hiok Nee, leader of the Johor Ngee Heng society, as Major China of Johor in 1870 as well as Council of State, to look after Chinese community affairs. 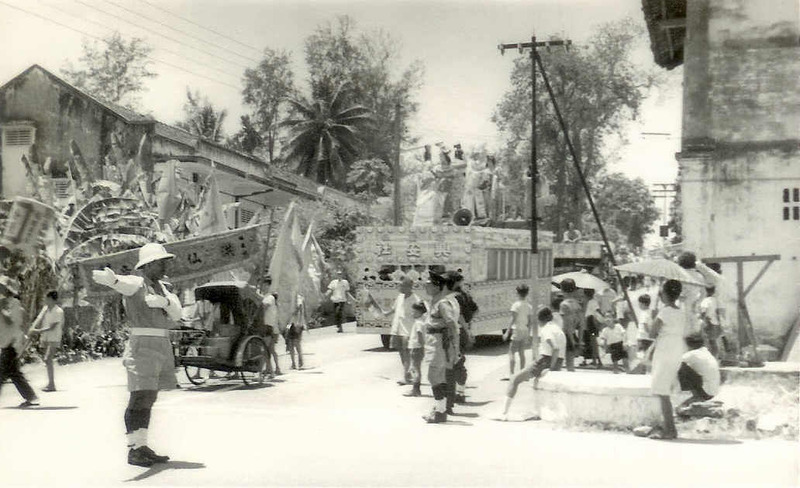 A group of Chinese community leaders led by Tan Hiok Nee, built the Johor Gu Miao. Dubbed the Temple of Unity, it uniquely houses the deities worshipped by the five main dialect groups under one roof. The annual Chingay parade is part of a 3-day religious celebration for the five deities, namely “Zhao Da Yuan Shuai” (Hainanese), “Hua Guang Da Di” (Cantonese), “Gan Tian Da Di” (Hakka), “Hong Xian Da Di” (Hokkien) and “Yuan Tian Shang Di” (Teochew). Generations of Johor Chinese have passed down a legend that the temple was declared opened by Sultan Abu Bakar while he was on a walk with his good friend, Tan Hiok Nee! 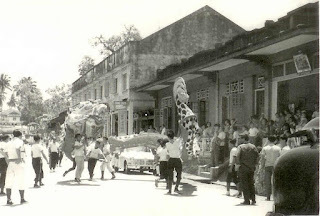 While the Chingay originated as a religious tradition where the temple deities were taken on an annual “tour” to bless the city with peace and harmony, good weather for cultivation of gambier and to celebrate the plantations’ good harvest, the parade has evolved into a cultural carnival. I have vivid memories of this pulsating parade because it used to pass our grandfather’s house at No. 154 Jalan Ngee Heng and photos of the 1968 Chingay, captured by our Uncle Victor, are treasured mementoes. This spectacular show is now held on such a grand scale that it is a major tourist attraction with foreign media coverage and even documented by Asian broadcasting channels. In the 2009 Johor Tourism Awards, the Johor Chingay was honoured as the Best Domestic Event and recognised as a National Cultural Heritage in 2012. The warm relationship between the Johor royal family and Chinese in the pioneering era is reflected in two sets of Chinese couplets presented by the Chinese community leaders at the inauguration of the Johor sultanate and preserved in the Chinese Hall of the Sultan Abu Bakar Royal Palace Museum. As a benevolent ruler, Sultan Abu Bakar continued the goodwill started by his father and this special bond was bolstered by the next generations of Johor rulers to this day. The presence of aSultan Ibrahim at the parade marks a major milestone in Johor history as the rakyat witnessed first-hand, the strong relationship of Johor royalty with the Chinese community, rooted in links established by Temenggong Ibrahim. The Sultan’s presence was a shining example of strong race relations and proof of a ruler who truly has a heart for his people. Some 400 big-hearted friends enjoyed a dazzling floral show with a difference in the recent Love and Peace fund-raising event. Organised by a group of volunteers who helped to raise funds for building the Metta Lodge Buddhist Meditation Centre in Taman Johor Jaya, the event was dubbed “Love and Peace” to promote more goodwill in the community. After enjoying a sumptuous High Tea spread, guests then enjoyed a floral exhibition and show, coordinated by organising chairman, Doris Looi. Looi, a past-president of the Johor Baru chapter of Ikebana International, drew upon her experience in floral shows and invited her friends who are award-winning flower arrangement practitioners in Malaysia and Singapore, to participate in the event. "I just want everyone to share the joy of giving and the power of flowers,” said Looi who was glad that the show participants contributed voluntarily and the bulk of donations went into the /building fund. The show comprised a programme of ballet /and Spanish dance performances interspersed with a parade of elegant models who showed off a range of dazzling costumes that were creatively decorated by a variety of flowers. The event highlight was a demonstration by flower arrangement professionals, Tong Weng Seng, Lim Li Jun and Peter Chin, who demonstrated their skills in arranging flowers on their models. “This Love and Peace High Tea and Floral Exhibition & Show is the first in a series of fund-raising events planned to raise funds for the new building,” said fund-raising chairman, Lim Hock Teck. He said that generous donors contributed in cash and in kind, and thanked the professionals who volunteered their skills in the Floral Exhibition & Show and big-hearted friends like the venue-owners who offered the use of the event halls at minimal cost. Lim presented a donation cheque for RM119,500.00 on behalf of the organisers to Metta Lodge Meditation Centre Johor Baru chairman, Heng Chai Teet. Heng said their fund-raising effort started two months ago and the encouraging response in support of the building fund meant that construction should start in the last quarter of this year. Forty children from Project ABC, a Soroptomist International Johor Baru’s (SIJB) learning centres for Rohingya children, benefited from an arts therapy workshop conducted by The Red Pencil humanitarian mission, recently. The Red Pencil art therapists, Janice Liew and Viviana Ni Ming, kicked off the workshop with a 2-day training session with SIJB volunteers and teachers to equip them to conduct future arts therapy workshops with students. For each section of the visual journal, students were asked to respond to journal directives such as, “What I like or don’t like?” or “Where would I like to be?” and the students were invited to pick their choice of materials to create the own artwork in their journals. The materials provided include various media like coloured pencils and pens, crayons, acrylic and watercolour paints, and items like coloured paper, magazine pictures, buttons, sequins, ribbons and pieces of fabric. After their artwork were completed, each student was invited to discuss his design and share with the class, his thoughts or the inspiration behind his art. “It was interesting to observe the students’ non-verbal language and see the expressions in their art,” said Liew, who is trained in psychology, special education as well as arts therapy. One of the most poignant pictures that evoked a great deal of emotion among the volunteers, was drawn by a student who recently lost his 39-year old mother in a massive heart attack. 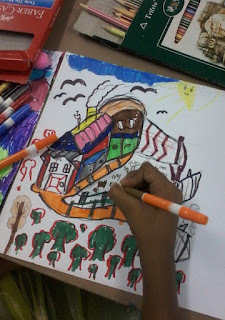 This student expressed “where he would like to be” when his subconscious feelings led him to draw a picture of a house complete with a smoking chimney. Later, he shared that it was his home and the chimney was smoking because his late mother was busy cooking in the kitchen. The Red Pencil workshop showed SIJB teachers and volunteers how arts therapy facilitates in trhe release, relief, reflection, repair and restoration in the lives of children, adolescents, adults and their families who are facing overwhelming life circumstances for which they have no words. Project ABC learning centres I & II in Kota Tinggi and Kulai were established in partnership with the United Nations High Commissioner for Refugees (UNHCR) to help Rohingya refuges children obtain a basic education. While the learning centres have a total of 250 students aged between 5 and 17, the students who participated in the 10-day arts therapy workshop in groups of 10, were aged from 10 to 16. The workshop was initiated by Project ABC coordinator, Soraya Alkaff-Gilmour, when she met The Red Pencil founder and managing director, Laurence Vandenborre, their international operations manager, Manuela Panos Gissler and programme executive, Karen Koh, last year. The Red Pencil arts therapy places emphasis on the process of creating and meaning-making rather than the end product and at the workshop held in the SIJB Kulai learning centre, students were guided to create their own visual journals. By offering other means than words to express what the participants were going through, the workshop offers powerful techniques to help resolve conflicts and problems, develop interpersonal skills, manage behavior, reduce stress and trauma, increase self-esteem and self-awareness and achieve insights. 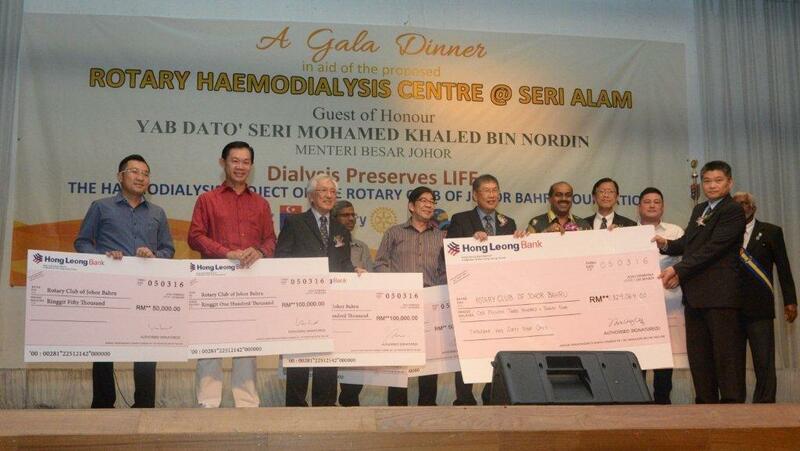 In a recent Gala Dinner, the Rotary Club of Johor Baru (RCJB) raised RM1.3 million to set up their second haemodialysis centre. The RCJB, the first NGO to provide subsidised dialysis treatments to needy patients in Johor Baru since 1992, aims to open their next dialysis centre in Bandar Seri Alam. It all started in 1989 when the Rotarians of the RCJB were encouraged by then Sultan of Johor, the late Sultan Iskandar Sultan Ismail, to establish large scale projects that would make a difference to the community in the long term. This spurred them to set up their first dialysis centre at Wisma Abad in 1992, a project which expanded to a 4-storey shoplot at Jalan Tun Abdul Razak and was officially declared open by Sultan Iskandar in 2004. RCJB continues to help needy patients lighten their burden with a highly subsidised rate of only RM60 per treatment, compared to the commercial cost of over RM250 per treatment, at their JB centre equipped with 19 dialysis machines to meet the needs of 80 patients in two daily treatment sessions. This initiative by the RCJB in JB has inspired other Rotary Clubs in Johor to set up similar treatment centres in JB, Kulai, Pontian, Kota Tinggi, Kluang, Mersing and Batu Pahat to meet the needs of the increasing number of patients. “The second treatment centre will be situated in Bandar Seri Alam to serve the needs of patients in Bandar Seri Alam, Taman Megah Ria, Masai and Pasir Gudang,” said RCJB president, Freddie Lee. He said the estimated population within a 10-km radius of the proposed centre is more than 300,000 people. Guest-of-honour for the Gala Dinner, Johor Menteri Besar Datuk Seri Mohd Khaled Nordin was represented by Johor State Exco Chairman for National Unity and Human Resources, Vidyananthan Ramanathan. On behalf of the Johor Menteri Besar, Vidyananthan announced that the state government pledged to contribute RM30,000 towards the RCJB Haemodialysis Project. Mock cheques were presented to the RCJB in generous donations from the family of the late Lim Kay Hua, Datuk Chua Song Lim Foundation, United Malayan Land Bhd, AME Construction Sdn Bhd, Tiong Nam Logistics Solutions Sdn Bhd, Tan Koon Seng and Dr Angamuthu Rajoo. As the community grows, the need to provide affordable dialysis treatment has also grown and this led to the initiative to set up a second dialysis centre for patients in and around Bandar Seri Alam. 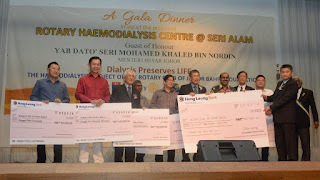 This new centre, known as the Rotary Haemodialysis Centre @ Seri Alam, would be initially equipped with at least 15 dialysis machines and gradually increased as the need arises. The estimated costs involved for building renovation, dialysis machines, a reverse osmosis water purification system and other fittings, is estimated in the region of RM700,000. As a not-for-profit treatment centre, the RCJB needs consistent public support to sustain operating costs which is estimated to be around RM200,000 a year. To donate, email to: lihui@umland.com.my or Tel: 607 – 3881111. The Class of 1978 of Sekolah Datuk Jaffar (SDJ) threw a surprise 80th birthday party for former principal, B. Harbhajan Singh, at their recent class reunion in Johor Baru. Organising committee chairman and former head prefect, Mohamad Taib Abbas, said they wanted to honour the former principal for changing the negative image of the school and turning out students who were now high achievers in various fields, locally and abroad. Taib, a senior assistant manager with Public Bank Berhad, Kuala Lumpur, was at the event with 90 of his former schoolmates and 18 teachers came from various parts of the country including East Malaysia, and Brunei and New Zealand. Former SDJ principal at his surprise birthday party! He said Harbhajan was their school principal for 18 years, from 1973 to 1991, making him the secondary school headmaster who served the second longest term in the history of Johor education. Harbhajan, a Kirkby College trained educationist, hails from Kuala Kangsar. He was formerly with Segamat High School before he was posted to SDJ, where he remained until his retirement. “We would not be here today if not for Mr Harbhajan and our teachers,” said Taib, voicing a sentiment shared by his former schoolmates, who proudly call themselves the Jaffarians. They fondly recalled how Harbhajan firmly believed in not sparing the rod and spoiling the child, the way he would hide a cane up his sleeve and how he would wield it to discipline wayward boys! “My father was a strict disciplinarian, firm in his principles and who seldom gave in to compromise,” said Kuldip Singh, Harbhajan’s son who was also of the Class of ’78. Kuldip enjoyed no favoritism as a student. In fact, if he received three strokes of the cane in school, he could count on receiving twice the number of strokes when he got home! When he was invited to say a few words, Harbhajan addressed the audience with wit and humour and had to stop himself from being long-winded because he felt as comfortable as when he was speaking at a school assembly. "School principals need the support of parents because the elders’ good values will set an example to children and teachers would not have to struggle with the problem of instilling discipline,” said Harbhajan. Harbhajan remembered some of their notorious students and recalled how he and the discipline master, Encik Yunus, met the families of these students and how, through counselling and guidance, the students went on to excel in not only their studies but also in sports. During his tenure as principal, the school turned out a number of sports personalities including national cricket players, Mohd Sham Jalil and Idris Abdul Rahman, and national footballers Muhidin Hussein and Amran Hassan. The school scored an 84% pass in the 1978 SPM examinations. The Best Student, Pow Chun Wei, went on to qualify as a doctor and now runs a private practice in aesthetic medicine in Singapore. Other Jaffarians of repute from the Class of 1978, are Datuk Mahfar Ali, Group Editor of Berita Harian newspaper and Aznor Mahat who is with the Ministry of Foreign Affairs and was involved with handling the MH17 tragedy while he was a diplomat based in Ukraine. tCelebrated with a sumptuous high tea and birthday cake for Harbhajan, the event ended with gift and memento presentations to the former principal and teachers. Austin Heights Fun Village, with five themed attractions, is set to become a premier edutainment and holiday destination in Johor Baru. Sprawling over 20 acres of land adjacent to residential and commercial developments in Austin Heights, the Fun Village is made up of the Water Park, Adventure Park, Sports & Leisure Park, Enrichment Park and a Golf & Hotel Resort. While Austin Heights started as a property developer in 2004, plans to create the edutainment destination was initiated three years ago with construction of the theme park completed in stages. “The creation of the Austin Heights Fun Village is part of our Corporate Social Responsibility commitment to the community who have chosen to live in Austin Heights,” said founder and managing director of Austin Heights, Datuk Ir Steve Chong Yoon On. which features 51 elements in its extreme rope course! “We want to make Austin Heights commercially vibrant and very livable,” he added. The development, situated just a 20-minute drive from JB city, is designed as an integrated fun and adventure entertainment complex for family bonding, corporate teambuilding and group outings for local and foreign visitors. Thrill-seekers can expect adrenalin-pumping fun in the Adventure Park when they are challenged to experience the longest indoor suspension rope course in Johor. The Adventure Park features rope and steel cable suspension structures that link through the indoor entrance area to the open area that overlooks a scenic view of the Water Park. Equipped with state-of-the-art rides equipment, the Water Park comprises the Hola Flora kid’s pool, Splash World water-play structure, Super Surf 6-lane multi-slide, Turbolance, space boat, uphill and black hole flying boats, swim-up bar, splash pool, wave pool, lagoon and lazy river as well as cabanas and picnic areas. The Sports & Leisure Park is made up of three indoor fun activities in the Topical Ice-Skating Rink, the Drift Cart circuit and the Jump Street trampoline centre. Ice-skating in tropical weather is now a reality in JB where a skating rink is created with an artificial ice skating surface which is 95% similar to natural ice. The Drift Cart circuit offers the next best thing to the thrill of car drifting in an exciting experience of skillful maneuvering in go-kart drifting! The trampoline centre is designed with features that match with the skills and fitness levels of jump enthusiasts to enjoy bouncing around in sections like the Main Court, Dodge Ball Court, Slam-Dunk, High Performance Area, Foam Pit and Air Bag. “When completed, this edutainment destination will include a 300-room hotel, dining and shopping facilities as well as indoor and outdoor entertainment areas,” said Chong who explained that their International Convention and Banquet Hall will incorporate a Performing Arts Centre and an art & handicrafts centre.